The HD Digitech HDX-1000 is probably the nearest thing I've seen yet to a cinephile-grade multimedia streamer. Unlike practically every other networkable box on the market, its construction is superb. Styled like the Mac Mini, it features a heavy aluminium alloy chassis that inspires confidence and contains hard drive operational noise. 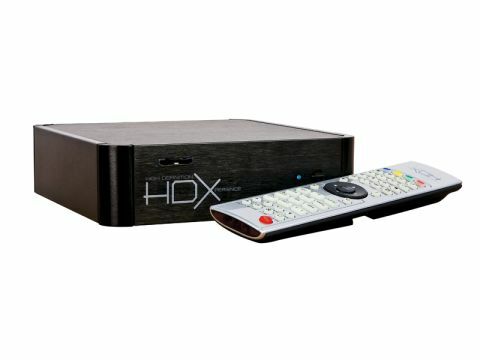 Like others of its ilk, the HDX-1000 is designed to sit on a network and hooks-up directly to your TV, or your AV receiver, via HDMI or legacy connections. It generally ships without a hard drive, but installing one (the box is compatible with 3.5in and 2.5in SATA drives) is a painless operation. The HDX uses the same Syabas middleware as the Popcorn Hour A-110 and C-200 – and that means identical functionality. This is a very good thing – we loved the usability of the original PCH – but this particular Network Media Tank has the added benefit of really being built like a tank. If you have media (be it music, video, images) on your home network this puppy will find it. It runs in multiple guises – DLNA, SMB, uPnP – which means it's visible to almost everything you'll have connected. With no effort at all, I could access it via a PC, Xbox 360, PlayStation 3 and other clients. Installation is a breeze. As soon as the HDX goes online it lists available workgroups and attached devices using AutoSMB. As long as your storage device doesn't require a password you should be in; this compares starkly to Manual SMB devices, like the TiVX M-6500A, which tend to be a nightmare to setup and use. The unit handles most file formats, from MP3s to FLAC as well as common video stuff like MPEG-2, MPEG-4, DivX and 720p MKVs. A diskless HDX-1000, as tested here, typically sells for around £190. I popped a Seagate Barracuda 1TB drive into our sample, which allows for an enormous amount of media to be stored locally. There's no need to use a massive drive, though. If you already have a capacious NAS somewhere else, a much smaller housekeeping drive could be installed. In that configuration the HDX-1000 would function more as a streamer. If you don't want to do the HDD install yourself, you can buy a pre-fitted model for around £270 with 1TB storage, from the UK distributor ripcaster.co.uk. One aspect of the Syabas middleware I love is the online access it provides to other stuff. Via the main Media Services portal, you can access YouTube, Flickr, VideoCast, Cranky Geeks and much more. A community portal (which frankly hasn't been updated for yonks) offers other treats, including access to Apple Movie Trailers and Miro – which in itself is a microcosm of diverse content. There's also extensive podcast access. In many ways, you could consider the HDX a set-top box for internet TV services – and like Freeview there are no subscriptions to be paid. Connectivity other than the HDMI includes Ethernet jack, gold-plated component, composite and phono stereo outputs, two USB inputs and a USB slave for hooking up directly to a PC and transferring files. Digital audio is delivered via coaxial and optical. Overall performance is excellent. Over my wired network, hi-def files streamed smoothly without stuttering. Apparently Blu-ray rips will also play with hi-res audio intact, although this was not tested. However, while the unit is fine for AV, I found it way too sluggish for photo browsing. Hi-res images take much too long to render. Consequently, I didn't find much use for the front-mounted 3-in 1 card reader (which takes Memory Stick, SDHC and MMC media). A BitTorrent client is also provided but the implementation is clunky and not really worth pursuing. I'd rate the HDX-1000 as a top-flight jukebox. Build quality is gorgeous and functionality supreme. If you suffer from media file disorganisation, you'll soon wonder how you ever lived without it.